Women’s History in the Digital World 2015: Register now! Join us at Bryn Mawr College, May 21-22, 2015! Campus photography via Bryn Mawr College Communications. 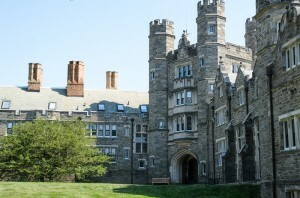 Women’s History in the Digital World 2015, the second conference of The Albert M. Greenfield Digital Center for the History of Women’s Education, will be held on the campus of Bryn Mawr College on May 21-22. We aim to bring together experts, novices, and all those in between to share insights, lessons, and resources for the many projects emerging at the crossroads of history, the digital humanities, and women’s and gender studies. A draft program for the two days is now available as a PDF [updated 5/7/15]. We are thrilled to host more than seventy presenters, representing projects from the U.S., Canada, Europe, Asia, and the Middle East. Conference participants are asked to pre-register by Friday, May 1. A conference fee of $50 USD includes coffee breaks, a light breakfast on Friday, and Friday lunch. The registration fee will be waived for current Bryn Mawr College students. Radnor Hotel (591 East Lancaster Ave., Wayne, PA): $159/night. Call 1-800-537-3000 and ask for the Bryn Mawr College rooms. Holiday Inn Express Midtown (1305 Walnut Street): $159/night. Call (888)-752-5341 and ask for Bryn Mawr College rooms. Marriott Courtyard Philadelphia Downtown (21 N. Juniper Street): $179/night: Call Marriott Reservations at 1 (800) 321-2211 or (215) 496-3200 and ask for Bryn Mawr College group rate. We’ve updated our conference hashtag on Twitter: #WHDigWrld15! The official conference website has been updated with transit directions to campus, the link to preregistration, and, shortly, a full conference schedule (currently available as a PDF, here). The conference site also acts as a repository for conference related materials after the event, so if you can’t make it be sure to check back for copies of the presentations you missed. This entry was posted in Conferences & Events, Features, News and tagged Bryn Mawr College, Conference, Digital humanities, Women's History in the Digital World by Monica L. Mercado. Bookmark the permalink. I would like to be on the email list for the Women’s History in the Digital world conference. Thank you. We’ve added you to our email list, and you will receive our next communication shortly. Please add me to the email list. thank you.